The Hidden Brotherhood (Adelphon Kruptos) is the only organization of its kind in the world today, a real secret society for real people. It does not restrict its membership solely to those born into wealth, privilege and power, but opens the doors of fraternal friendship to those who desire and need most to overcome the limitations of their past circumstances. Through superior knowledge and an organized hidden brotherhood of power, we shall each and everyone of us attain to wisdom, wealth and success. 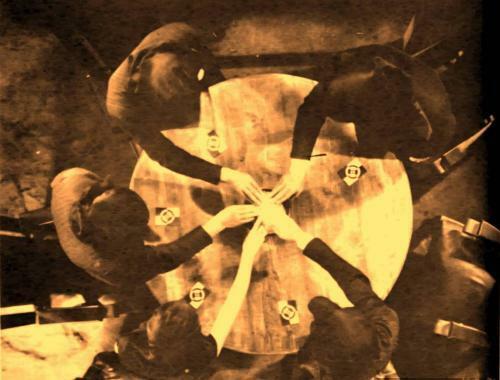 WEALTH - POWER - SUCCESS - For All Members, obtained and shared though the Hidden Brotherhood's secret knowledge and hidden circles of power — these are our aims. The Hidden Brotherhood teaches a secret system of power, hidden knowledge and united brotherhood which can raise the poorest and most humble of men into the ranks of the rich and powerful, and achieve even the most impossible dream. The Hidden Brotherhood offers the bonds of brotherhood to anyone with a brave heart and a daring spirit who will cast their fortunes with us. We will lead you upon the path to power and a brave new life filled with golden opportunities, friends, money and success. ALERT! This is the only authentic web page for the Hidden Brotherhood. There are many online imitations. We have no connection to the "Hidden Brotherhood" Facebook page, the "Blackheart Brotherhood" or any similar websites which steal our material in order to dupe gullible people out of their money. Beware of liars and fakes. January 7, 2019 - New packages updated and now being sent out.